This game is created for iPhone and iPod Touch. Game is available in Language: Turkish, English, German and French for now. 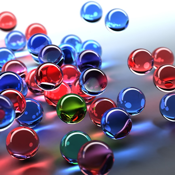 Aim is to bring five or more balls of same color in line - horizontally and vertically. If five or more balls come to same direction, user gets points equal to number of balls. Three balls are added for each action in the game. At the end of game, user can submit score to Global Score Table.